Robert Earl Butts, Jr., was executed by the state of Georgia on Friday, May 4, 2018. He was pronounced dead at 9:58 pm EDT, inside the execution chamber at the Georgia Diagnostic and Classification Prison in Jackson, Georgia. He was 40 years of age. 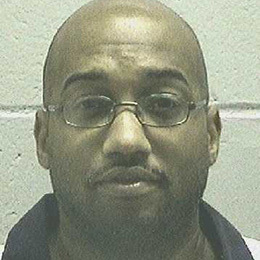 Robert was convicted of the murder of Donovan Corey Parks on March 28, 1996, in Milledgeville, Georgia. Robert spent the last 19 years of his life on Georgia’s death row. Robert’s execution was scheduled for Thursday, May 3, 2018, however, he was granted a stay of execution on Wednesday, May 2, 2018, by the Georgia Board of Pardons and Paroles. The execution was stayed to allow the board additionally time to consider Robert’s appeal that his death sentence should be commuted due to a former witness recanting their testimony. The Georgia Board of Pardons and Paroles lifted their temporary stay of execution the day after it was issued. Following that, the Georgia Department of Corrections announced that the execution was rescheduled for Friday, which is within the time frame stated on the execution warrant. Robert’s execution was further delayed on May 4, 2018, due to last minute appeals to the Supreme Court of the United States. These appeals were ultimately denied, allowing the execution to proceed. Robert had a difficult and neglected childhood. His mother was addicted to alcohol and cocaine and his father suffered from a mental illness. At the time of his arrest, Robert was a member of a gang. Robert had held multiple jobs prior to his arrest, however, he was frequently fired due to his inability to get along with others. In at least one job, Robert engaged in a fist fight with a customer. On March 28, 1996, Robert Butts and Marion Wilson, Jr., took Butts’ vehicle to Wal-Mart, where they began searching for a victim. Butts and Wilson were observed entering the store and getting in a check-out line behind a man later identified as Donovan Corey Parks, a prison guard. Butts only purchased a pack of chewing gum. Butts was observed asking Donovan if he could give Butts and Wilson a ride. Donovan agreed, moving items in his vehicle to make room for the two men. A short while later, according a witness who heard Butts confess to the crime, Butts pulled a shotgun on Donovan and ordered him to stop. Wilson dragged Donovan out of the vehicle, tied him up, and ordered him to lie facedown on the pavement. Butts fired a fatal shot into the back of Donovan’s head. Nearby witnesses who heard the shot, thought it was a vehicle backfiring. Butts and Wilson took Donovan’s vehicle to service station in Gray, Georgia, where they were caught on security camera refueling the vehicle. The duo then drove to Atlanta, Georgia and attempted to sell the vehicle to a “chop shop.” When that was unsuccessful, they purchased two cans of gasoline, drove to a remote location and set the vehicle on fire. Then they walked to a payphone, and called Butts’ uncle to come pick them up and take them to retrieve Butts’ abandoned vehicle. During Butts’ trial, two of his former jail mates testified that Butts had confessed to being the triggerman in the murder. He was found guilty and sentenced to defat for malice murder, armed robbery, hijacking a mother vehicle, possession of a firearm during the commission of a crime, and possession of a sawed-off shotgun on November 21, 1998. In a separate trial, Wilson was also sentenced to death. Please pray for peace for the family of Donovan Parks. Please pray for healing for the family of Robert Butts.